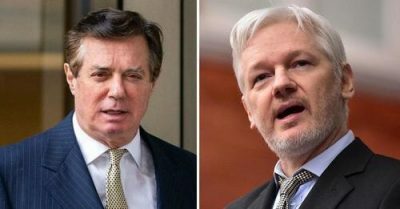 A former consul and first secretary at the Ecuadorian embassy in London has put the final nail in the coffin of credibility for The Guardian, refuting the paper’s fantastical and wholly unsupported claim that former Trump campaign manager Paul Manafort visited WikiLeaks founder Julian Assange in 2013, 2015 and the spring of 2016 – a charge vehemently denied by all parties involved. Fidel Narváez – who worked at Ecuador’s London embassy from 2010 – 2018 has told The Canary that The Guardian‘s claim is entirely false. The Canary has also reviewed a copy of correspondence between the Guardian and Narváez in which he makes a formal complaint accusing the paper of fabricating an earlier story about a Kremlin plot to smuggle Assange to Russia. Narváez – initially consul and then first secretary at the embassy, told the Canary that to his knowledge, Manafort never visited the embassy while he was employed there. What’s more, his account supports points made by The Intercept‘s Glenn Greenwald about visitation rights at the embassy. This answer is counter to a statement made by Manafort following the story’s publication, in which he said “We are considering all legal options against the Guardian who proceeded with this story even after being notified by my representatives that it was false.”Furthermore, Manafort’s passport stamps also refute the Guardian‘s reporting, after the Washington Times reported that Manafort’s three passports reveal just two visits to England in 2010 and 2012, which support his categorical denial of the “totally false and deliberately libelous” report in The Guardian, which said that Manafort visited Assange in the Ecuadorian Embassy – ostensibly to coordinate on the WikiLeaks release of Hillary Clinton’s emails. No word on whether they’ve taken the organization up on its offer.